On arrival at the railway station meet with the representative and transfer to the small hotel for freshen up & breakfast. After breakfast meet with our representative, briefing and board the open jeep to drive towards Dhikala (the core area of the national park) & Enjoy morning jeep safari. After that free time for relaxation. Time for lunch. After lunch time for jeep safari at Dhikala zone. Dinner and overnight stay at the lodge. Morning jeep safari for wildlife viewing. Return to the lodge around 10:00 am and time for breakfast. After breakfast time for relaxation or you can go for watch tower or you can have a walk within the reserve area. Time for lunch. After lunch once again time for afternoon open jeep safari. Dinner and overnight stay at the lodge. 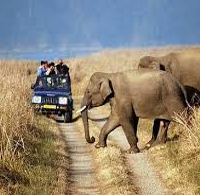 Morning jeep & elephant safari for wildlife viewing. Return to the lodge around 10:00 am and time for breakfast. After breakfast check-out from the rooms. Time for another jeep safari for the national park. Late afternoon drive back to the town area. After dinner in time transfer to the railway station to board the train for Delhi.